W.1. Write arguments to support claims in an analysis of substantive topics or texts using valid reasoning and relevant and sufficient evidence. W.2. Write informative/explanatory texts to examine and convey complex ideas and information clearly and accurately through the effective selection, organization, and analysis of content. W.3. Write narratives to develop real or imagined experiences or events using effective technique, well-chosen details and well-structured event sequences. W.6. Use technology, including the Internet, to produce and publish writing and to interact and collaborate with others. How do you KNOW when students meet these standards? There are specific grade level standards that further illuminate the expectations for the end of the grade for each of the 13 years that students are in school. Materials can be found for both instruction and assessment at all grade levels. As a critical consumer, you can sift through those resources to find the ones that provide authentic writing opportunities for ALL students and a plethora of evidence of student growth. A three page checklist with a variety of “levels” describing writing for students in grades K-5 can be found here. This checklist is aligned with the Common Core writing standards that are outlined above. Districts using standards-based reporting systems also have several variations of checklists or rubrics designed to measure “growth”. Can you tell if a student is “making progress” from this checklist?
. . . Student Role in Assessment? However, a system of measurement would be remiss if it did not provide student self-assessment of writing progress. That progress can be captured in the children’s own words as in Dana Murphy’s blog here: “What Do You Know About Being a Writer?” The words of kindergartners remind us that reflection on learning needs to begin early – In kindergarten! Are all students developmentally ready for writing when they enter kindergarten? The chart below would suggest that there are many levels that can be “named” for early writing stages. Waiting for “readiness” is not the answer. Lack of quality writing experiences prior to school is also not an acceptable excuse. Building a need for writing is critical from the first day of kindergarten. How and when can and should the student be writing? The end goal for the kindergarten year is “writing” and will require both instruction and practice each and every day of school. However, quality writing instruction can and should accelerate student writing because kindergartners are encouraged to “draw and write” all year long. Will EVERY student go through every stage? Perhaps not. Maybe splitting out so many stages really just slows down the learning for students. Do kindergarten writers deserve quality instructional opportunities that engage them in authentic learning? Consider this: “Revision may seem like something older kids do, but really kindergartners revise in the block center so why not in writing.” -Lucy Calkins (TCRWP Saturday Reunion, 10.18.2014) Check your beliefs at the door. Open your eyes and mind to the standards to see which ones are “Mission Possible” for kindergartners. Are teacher beliefs holding students back? Is growth about counting the levels or writers who who read, talk, and do the real work of writing EVERY day? Once students are sure that they have stories to share, they will be able to write those stories! Once writers are TAUGHT at all grade levels, writing quality will improve. No more assigning writing. No more teaching writing. Later this week, I am working with a group of 4th & 5th grade teachers, observing and taking about writing: its purpose, their measurement of outcomes, and how to improve teaching & learning (for them and student writers). As I put my notes and the presentation sleds together, I struggled with the words, “teach writing.” As a writer myself, I’m not sure how much of the craft I was taught and how mch of the craft I have learned. Your closure gave me the words my brain wanted by could not generate: “teach writers.” Thank you, friend! I love that graphic because it says so much about the desired state as well as some ways to get there! I so love to teach writers of all sizes and ages! You are welcome! This is great Fran. Continuums are always interesting, but I especially like the reminder to have students self assess. Michelle Hasletine’s class is writing about why they write. I read a few last night they remind me of what you are saying here about self assessment. Where kids are on the continuum matter, but where and how they see themselves as writers is as important. Thanks for the reminder. Thanks, Julieanne. In our rush to “collect the data” we absolutely cannot forget the students. Their self-efficiacy (or lack of it) keeps students moving! It’s so critical that student voices be heard loudly and multiple times! Thanks, Fran ~ This came at just the right time. I have teachers I’m coaching who have not really taught writing before, and are struggling with the assessment piece. This provides a nice framework and some nice tools to think about writing instruction and assessment. Fran, I always learn so much from your posts. This is no exception. 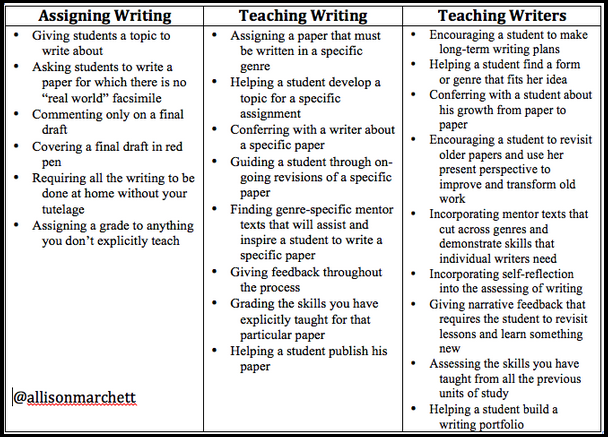 I love the chart on assigning writing, teaching writing and teaching writers. And I love the Calkins quote about Kindergarten revision. Thanks for helping me think about things that will help me be a more effective teacher. Lisa, That Calkins quote from Saturday’s reunion was one that I almost missed but I have put into my “gold” pile. This is so complicated but when our focus is on teaching writers, the instruction becomes much simpler! Thanks for stopping by! I look forward to “seeing you” soon. NCTE, perhaps??? I will be there from Thursday evening until midday Saturday. 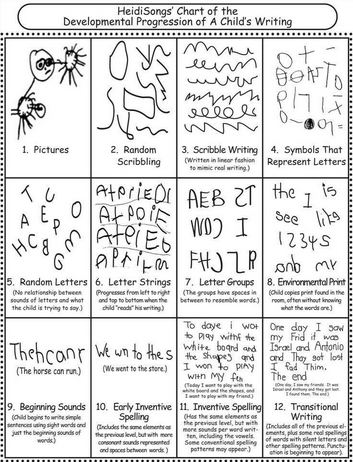 Fran, I really like the chart of the developmental stages of kindergarten writing. We used a rubric with similar stages, and it really helped us. Especially as we were going in to confer with students – we had an idea of where we might be nudging them to go next. Thanks so much, Dana! Clear examples are always so helpful in thinking about what comes next. I worry that some might interpret that the “pictures” end when students begin scribbling as students can always use pictures in the revision process to add more details to strengthen the story with additional reasons or evidence. Specific conversations will help with common understandings that will move students forward as writers – confidently and capably! This brings me back to my adventures with checklists, Fran – it’s so essential to help our students self assess, to set the up to be able to “see” their own revision process. Thanks for sharing. Thanks, Clare and Tammy. I think we have to make sure that we continue to visit our expectations – way too many older students talk about the lack of challenge and the sheer boredom in their school lives. Student voices are such an important part of this process. And, yes, my favorite structure is question and answer! Great post, Fran. I love the charts that you have shared and I have pinned them so that I can share them with teachers. Thanks! Thanks, Melanie! I’m loving your color-coded writing elaboration work at http://tworeflectiveteachers.blogspot.com/ One of my true joys from PD/coaching is the ability to practice/revise lessons! Teach writers! Yes! Thank you for this insightful post, Fran, and for the charts. I know my colleagues will find them extremely helpful.